Bouncing back from a loss in the first game of Wednesday’s doubleheader in Colby, the Barton Community College baseball team salvaged the split at Colby Community College. The Cougars were shut down and limited to three hits in the first game losing 3-0 but responded with thirteen hits in the nightcap in winning 7-5. Having to split the original four game series into two different dates consisting of doubleheaders, Barton took three games in the series having won the first two games of the series last Wednesday knocking off the Trojans 3-1 and 9-4. 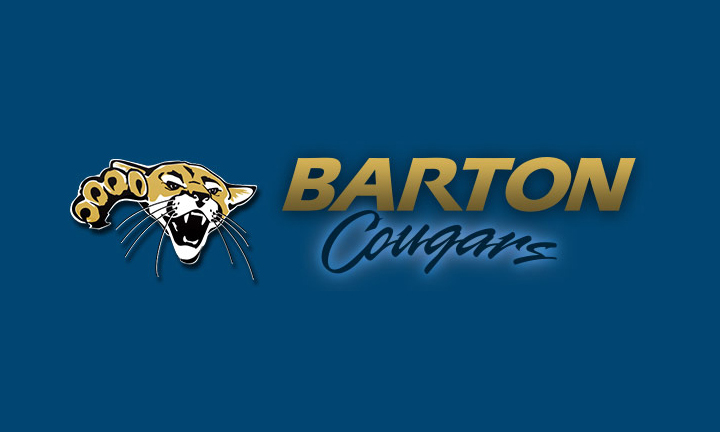 Barton remains at the .500 mark in conference play at 6-6 with a season’s record of 11-12. The Cougars will stay on the road for their next series heading to MCC-Longview Community College for a 1:00 p.m. doubleheader on Saturday and a noon first pitch for Sunday’s twin bill. Colby did all their damage in the first game’s fifth getting three straight singles to open the inning. Following a sacrifice fly, a two-base infield error tacked on two more runs. The Cougars had a single runner on each inning but that’s all Colby’s Jeremy Gwinn would give up in improving to 4-1 on the season. Alexander Evans took another hard luck loss in the first game dropping to 0-3 as a starter despite scattering only five hits, no walks, while striking out three in giving up only one unearned run. Evan McDonald, Grant Watkins, and Josh Farrington each were 1-for-3 from the plate as the Cougars were outhit 5-3 while stranding five to Colby’s four. Standing two runners in the top of game two, Barton again got the leadoff aboard in the second as Turner leadoff with a walk. Advancing to second on an error by starting pitcher Spencer Dienes, Turner scored two pitches later as Trevor Hughes found the right field grass. .Back came the Cougars in the top of the third as McDonald reached on a 1-out walk followed by Watkins and Lance White hitting singles to load the bases. Following a Turner sacrifice fly to tie the game, Hughes reloaded the base with a single. Barton then took the leads as Farrington fought off a 0-2 pitch hitting a hard ground ball the Colby third baseman couldn’t handle. The Trojans once again came back in the home half as martin delivered a one-out double to center setting up Ben Dalke’s two out single to center to knot things up at 3 apiece. A two-out rally in the fifth would put the Cougars up by two. Hughes reached base after being hit by a pitch and Farrington hit a double to give Barton two runners in scoring position. Designated hitter Xaiver Sundman came through in the clutch with a single to center as Barton had its biggest lead of the game. A leadoff single by the Trojans was quickly sacrificed into scoring position as Colby looked to respond in the bottom of the inning. Down to their last out, Dalke knocked in his second run batted in with a single to left to draw the Trojans to within one. The one run lead held up into the seventh but a leadoff walk came back to bite reliever Jackson Rose as Dalke came through again with a double to center to tie it at five. With three straight one-out singles but Minor, Richardson, and McDonald, the Cougars appeared headed to strand the bases juiced but White drove a 2-2 pitch to center giving Barton its final two run lead. Striking out the first two Trojans in the eighth, Rose walked the next batter before giving way to Shane Adams. Adams got the final out and only surrendered a one-out hit by pitch in the ninth to seal the game for his third save of the season. Rose earned the win to improve to 2-0 on the season going 2.1 innings of two hits, two walks, and three strikeouts. Outhitting Colby 13-11 in the nightcap, Hughes led the hit parade going 3-for-4 while Richardson, Watkins, and White each put up multi-hit 2-ofr-5 performances. White and Sundman each drove in two runs while McDonald reached base four times on three walks and 1-for-2 from the plate.